Just out of the Spanish Main. Bold Daniel he did say. “Where are you from?” he cries. We’re back to the repertoire of Minnesota singer Michael Cassius Dean (1857-1931) this week with a song about piracy. 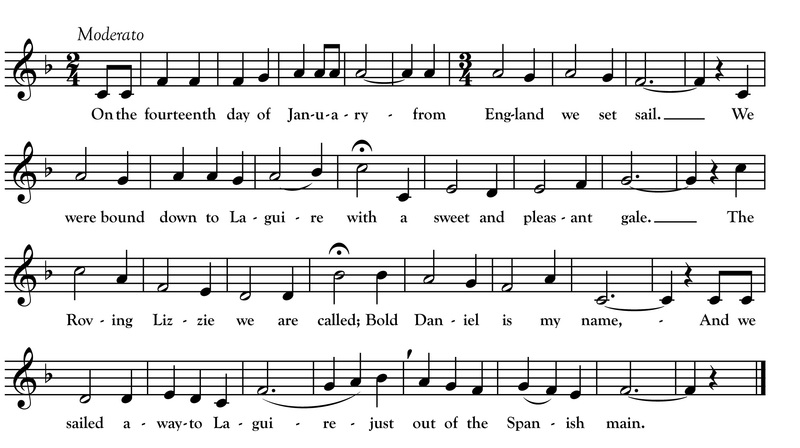 The “Laguire” mentioned in this song must be La Guaira, the chief port city of Venezuela which was actually sacked by English pirates in 1743. The song is relatively rare in tradition. The other three versions I have found were collected in coastal areas of Maine, Newfoundland and England. Mike Dean sang two other songs about pirates “The Flying Cloud” and “Paul Jones the Privateer” and perhaps was fascinated with the theme after working as a sailor on the Great Lakes himself. The above transcription is my own made from my digital copy of a recording made of Dean’s singing in September 1924 by folk song collector Robert Winslow Gordon. Gordon recorded Dean singing the first verse only. The full text comes from Dean’s 1922 self-published songster The Flying Cloud.